Jamie Murray says his motivation levels are higher than ever after capping a superb run of form by becoming world number one. The Scot will top the doubles rankings on 4 April after reaching three Grand Slam finals, winning the Australian Open and the Davis Cup. "It's an awesome feeling," said the 29-year-old. "I think definitely my motivation is even higher than before, now that I've got here. You want to stay here." 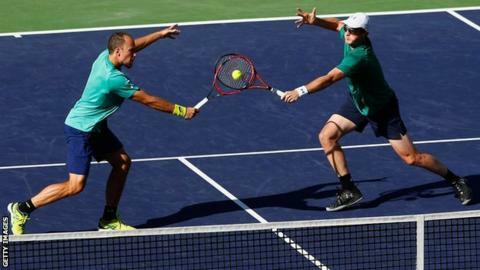 Murray and Brazilian partner Bruno Soares lost their opening match at the Miami Open on Saturday, but defeat for current number one Marcelo Melo of Brazil ensured Murray will overtake him in the rankings. "I didn't even know Marcelo was playing his match and then my phone just started going crazy, lots of people messaging me," said Murray. He has played with 63 different partners since making his professional debut in 2003, including 15 in 2012 alone. Consistent success came first alongside Australian John Peers, with the pair reaching the Wimbledon and US Open finals last year. Murray then claimed his first men's doubles Grand Slam title with Soares at the Australian Open in January. "My career's had a lot of ups and downs," he said. "Once I started playing with John Peers in 2013, that gave me a huge lift, a lot of direction, which I needed." Murray said the "best decision of all" was working with coach Louis Cayer, adding: "He got me to think how I could be successful on the court and today we're here, number one." Murray beat his younger brother Andy to a first major title by winning the Wimbledon mixed doubles title in 2007 and has now reached the top of the rankings first, with his sibling currently number two in singles. "Andy's obviously been at the top of the game for such a long time but hasn't been able to do it because the level that these guys are playing at these days is so incredibly high," said Murray. "He's having an amazing career and done so many great things on the court. "He inspired me to try and max out in my tennis and be the best I can be. I think bar a couple of players, or a slightly different generation, he would have been there. Hopefully he can still make it."